← May All Positive Energies Continually Increase! In the Yungdrung Bön tradition, there is a foundational practice called The Four Reflections that Reverse the Mind. Reflecting upon these truths and realizing them for one’s self naturally turns the mind to spiritual practice and gives the practitioner a solid foundation for all future practice. Reflecting upon the precious rarity of having a human birth and resolving to not waste it. Here, the practitioner reflects upon the difficulty of attaining birth as a human being. It is like tossing a handful of beans onto a stone wall. Most of the beans fall to the ground and only a very few stick. Being born into a human body gives the best opportunity for spiritual development and practice. Reflecting upon the truth of impermanence. Here, the practitioner deeply reflects upon the inevitability of change and the uncertainty of future conditions. This realization brings an urgency to the motivation for spiritual practice. Reflecting upon the certain fruit of both positive and negative actions. Here, the practitioner reflects upon the unfailing result of both good and bad actions. Actions based upon the 10 non-virtues bring suffering and misery. Actions based upon the 10 virtues bring joy and positive results as well as supportive circumstances. Reflecting upon the faults of cyclic existence. Here, the practitioner reflects upon the truth that wherever one is born within cyclic existence, there is suffering and misery. There is no place to go or any worldly power strong enough to escape it. The only way out of suffering is the path given by the Enlightened Ones. Therefore, one naturally feels less and less attachment towards worldly things while developing a strong motivation towards spiritual development and devotion to the true and unfailing places of refuge. Posted on January 9, 2016, in Uncategorized. Bookmark the permalink. 2 Comments. 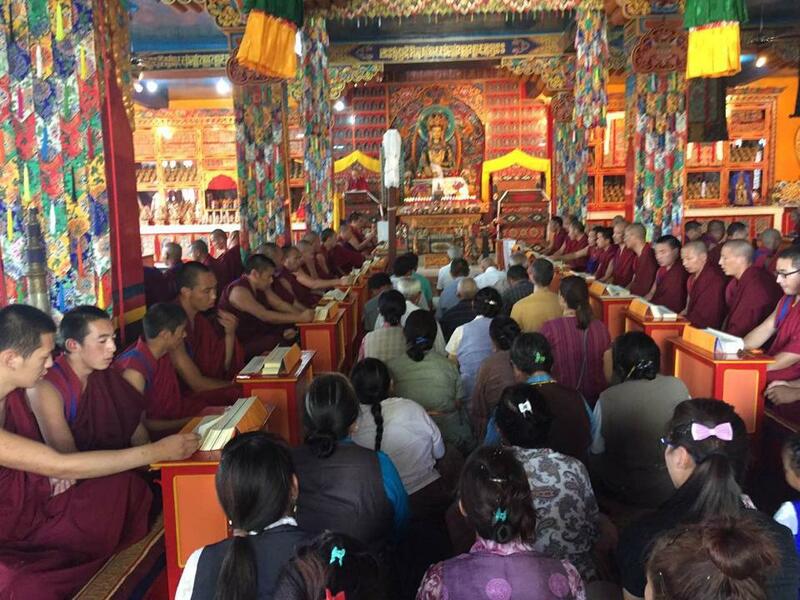 Hello Ida, this was taken during a large tsok offering to Sipe Gyalmo this year at Menri in India.